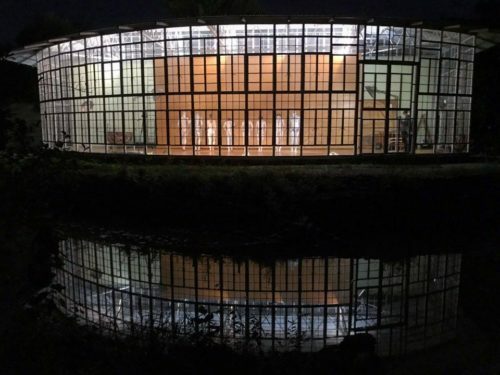 Rice University recently decided to dissolve their Public Art program and has cancelled Rebecca French Choreography’s contract for the scheduled April 13, 2019 Bodies of Light performance at the Turrell Skyspace. Please join Rebecca French Choreography at the new performance location, The Glass Crescent, on April 13, 2019 for a free performance of Bodies of Light. A collaboration of exciting and ethereal movement, music, costuming and video effects at one of Houston’s most intriguing architectural spaces. On April 13, 2019, eight dance artists will become Bodies of Light, a powerful and surreal performance exploring intersections of biology, technology and spirituality. Inspired by the transcendent environment–visionary HIVE founder Nestor Topchy’s beautiful Glass Crescent studio–Rebecca French Choreography will incorporate elements of Japanese Butoh and contemporary dance with both orchestral/electronic music and video projection-mapping. This free performance is one night only and not to be missed. This project is the culmination of over one year of collaborative planning, movement workshops, fundraising and preview performances. Bodies of Light is made possible by a community of 136 individual donor investors, the City of Houston through Houston Arts Alliance, Dance Source Houston’s Production Grant program and the Houston Ballet HIVE Choreography Lab. Important note: Seating at the event is outside, please dress accordingly. Transportation: Please consider using Lyft or Uber as parking on the street is limited. Cost: Free to the public, donations are encouraged. This free event requires a reservation, secure your tickets here.